As Easter approaches I find myself looking at things just a little more (ok maybe a lot more) differently than I have in the past. Easter will be the beginning of all the “firsts” that we will go through since the passing of Mandy, Scott, Lizzie and Judah. It will be painful as this would have also been Judah’s first Easter. Our family will carry on with the same traditions that we do each year. Friday night we will attend Good Friday services at our church and celebrate the Lord’s Supper. Saturday night we will color eggs with the children. Sunday morning, we will attend church, take our family photo in front of the cross and come home to hunt for eggs and eat a dinner complete with ham, mashed potatoes and baked macaroni and cheese. It will be hard, it will be sad but it will also be joyful. Joyful because we are celebrating our Lord and Savior Jesus Christ and His glorious resurrection. This year though, I have been pondering many things in my heart. I see things so much differently right now. Feelings are so much stronger, hope so much more important, thankfulness for what was and what will be so prevalent. But as I have been thinking on Easter this last ten days or so I found myself thinking of Mary and thinking about what she was feeling on Good Friday and Easter Sunday. I think because of what we have just walked through I can relate to Mary so much more this year than I have ever done so in the past. Can you imagine the scene? Mary being there, watching every step that her son was taking on the way to Golgotha, can you even imagine what must have been going through her mind? This woman, close to my own age I would imagine was drinking in every step, every lash, ever hit that her son was taking. Knowing that he was the Son of God certainly didn’t make it any easier for her of that I am sure. Knowing that my beautiful Mandy, Scott, Lizzie and Judah are sitting at the feet of Jesus doesn’t make losing them any easier or less painful. God chose Mary to be the mother of Jesus as a young girl. In those days, a woman just didn’t get pregnant out of wedlock it was unthinkable. The bible tells us in Luke 2:19 “But Mary kept all these things, and pondered them in her heart.”, oh the things that must have gone through Mary’s mind during those days of her pregnancy. I am sure that she never contemplated how the story would go, the chapters it would fill or the way that it would end and that the end would signify a new beginning. Personally, I can relate to this. I was a young, unwed pregnant girl with Mandy and I pondered a lot of things in my mind and heart during my pregnancy. I had no idea what the days, weeks, months and years ahead will hold for me and this baby I was carrying and I certainly had no idea how the story would end and a new story would begin. I am confident that just like any mother, Mary watched her young baby grow with awe and amazement. She guarded him when he was growing. She worried about him getting hurt. She was proud at his achievements whether learning to walk or teaching in the Temple. Just like all mother’s I am sure she had hopes and dreams for his future. As a woman who has just lost a daughter, a son-in-law and two precious grand babies I can tell you that the pain that Mary felt that day was real. The things she saw and heard that day seemed like a nightmare and she had no idea where to go from that point on. I can share that her soul cried out in a way that she had never imagined before and she felt numb and scared. As I stood in front of my family’s home on that early March morning I think I now know a bit more about how Mary felt standing in front of that cross. Disbelief and shock. Grief that was overwhelming. Her world would never be the same again, she would never feel the same as she had before, she would carry these pictures in her mind the rest of her days, a piece of her would always be missing. This Easter I have a renewed passion for the death, burial and resurrection of Jesus and the importance of what happened on that Good Friday and Easter Sunday morning so long ago. It is because of John 3:16: “For God so loved the world, that he gave his only begotten Son, that whosoever believeth in him should not perish, but have everlasting life.” that I know that Mandy, Scott, Lizzie and Judah are dancing with Jesus and that they are in awe of Him in a way that none of us will ever understand this side of heaven. It is that hope and belief that reassures me that we will be together again one day. I can almost hear my sweet Lizzie saying the words to one of her favorite songs “My God’s not dead, he’s surely alive!” And this Easter she gets to sing it straight to him. This makes my heart smile. 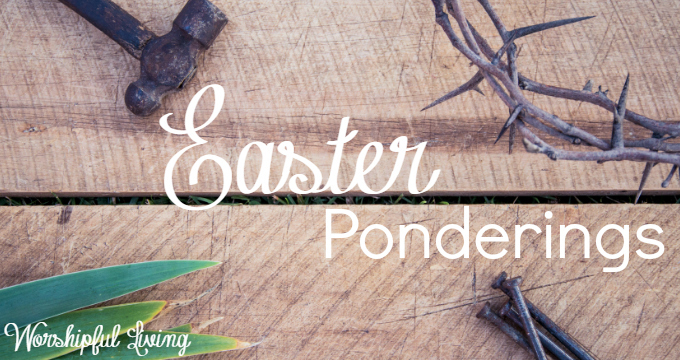 As I close my Easter ponderings I want to encourage you this year to look a little harder at Good Friday and Easter. No matter what you’ve been through or what you are going through now you have the glorious hope of what awaits each one of us if we believe in Him. I loved every word and I love you dearly, my sister. I continue to pray for you all and know that God has great plans for you and this blog. Know I will always be here for you no matter how far apart we live. I feel very privileged to call you MY SISTER IN LOVE ?. I am sorry you have to have all those first. You lost 4 people that you loved all at once. I understand losing a child. My only child, Bobby died 11 years ago this May. I have tried to Celebrate his life. Thank you for continuing this blog that Mandy built up. Thank you, Rhonda, for sharing your heart with us. I appreciate this more than you will ever know. We will all feel the loss of your daughter for a very long time. She impacted so many lives…so many hearts. She was dearly loved. Still is. Thank you for reminding us of Easter…of our Savior. That we really need to take the time this weekend to reflect and respond to Him. It is so good for our hearts. I have tears streaming down my face as I read this. Wow….this is such a beautiful post you have written, so much truth here. And you bring Mary to life in a whole new way. As a momma who lost her child 17 years ago (she was 2, died from vaccine induced cancer), I know I could not have survived these years if it were not for the hope Christ I have. Praying you through this first “Holiday”, as you celebrate our Savior, and still mourn your loss. Thank you Rhonda. For choosing to keep the flame here alive and burning. I like you Easter pondering. A call for us to focus on Jesus and the purpose of His coming. I can’t imagine what it will be like having your table without all four members of your family there…but I know Jesus is right there with you holding your hands. I love you my wonderful sister ??? Thank you Rhonda. That is a beautiful message. I too am feeling this Holy Week more deeply this year. God is great and worthy of all praise. His unfailing love for us and the promise of living again with Him in Heaven is an awesome strength to see us through this life. God bless and keep you all. You are in my prayers. Happy Ressurection Day. Thank you Rhonda for this beautiful post. My mother went to Jesus much the same way as Mandy answer her family. My mother went in for a “routine ” surgery on Oct. 29, 1992. The last thing we had talked about was the upcoming holiday’s. My mom loved that time of year. Well, later that day, I learned that there had been a medical mistake and mom died on the operating table. Well, my head knew mom was with Jesus but, my heart wouldn’t accept her being gone. My heart just accepted mom’s passing last year, 2016. I can tell you, it feels as if I lost her a few hours ago. I didn’t dwell on mom’s passing. But it just snuck up on my heart. Thank you for continuing with Mandy’s website. I’m so deeply deeply sorry for your loss. I have lost a child, and, while I devoutly believe in Christ, I too know what you mean when you say it does not make this any easier or any less painful, and that Easter has new meaning. I’m praying for you and yours. I’m just so sorry for your loss. With deepest sympathy. Love you for this dear heart! Thank you for this beautiful post. Your family has been and will continue to be in my prayers. I’m grateful that the Lord enabled you to articulate the ponderings in your heart. It is beautiful to see answered prayer and God lavishing His grace on you! The tomb is empty. We have a living hope in Jesus. Hallelujah! Beautiful. Thank you for sharing. I so enjoyed and was inspired reading Mandy’s words. Blessings to you. He has Risen! Thank you for opening your heart to continue the race Mandy ran. I am from Canada, and distance does not stop the love of God, either from coming or going! There is strength and healing within the community of faith, and I hope it helps uphold you for the rest of your life here on earth, no matter your sorrows. Love to you and your family, especially Scott and Mandy’s kids.